The song accompanying this post is Besos Discretos performed by Fusión Caribe, a fantastic band on the streets of Havana. Video follows below. 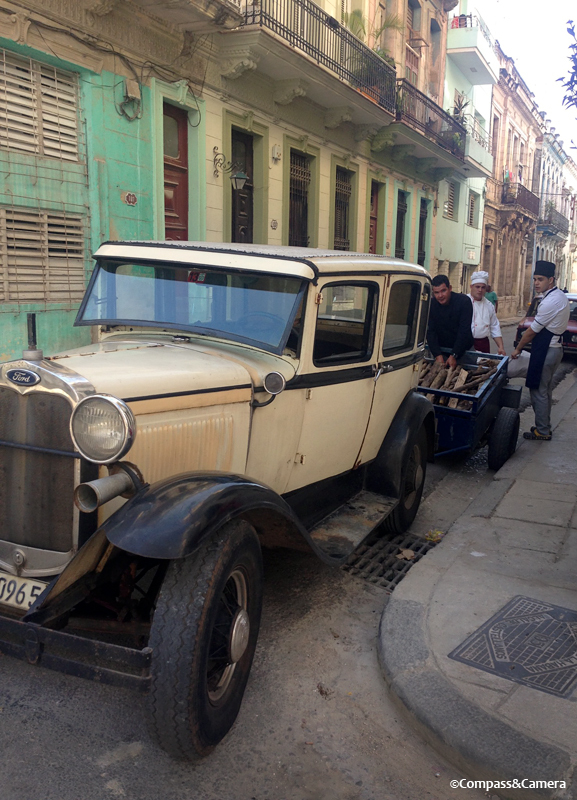 We arrive in darkness around midnight, packed in a taxi, creeping along a narrow street in La Habana Vieja. Our driver speaks very little English, but stopping and turning off the engine is a pretty clear indication that we’ve arrived at our casa particular. Our host meets us on the street and shows us into the building. We climb five flights of stairs and enter the tall wooden door to our apartment. Even though I’ve seen the photos online, our casa particular unexpectedly sweeps me up in its aura, with its decorative floor tiles and unreachable high ceilings. The photos on the wall offer a few hints about the history of the neighborhood over the past decades. The gold chandelier looks cherished but forgotten. The refrigerator is a relic. The parlor doors swing open to the warm night air and the balcony looks out on a street where thousands of days and nights and people have come and gone in Havana. This place has so many stories to tell. We sleep and wake up the next morning to music. It’s a fusion of sounds coming from all over — below us, out front, out back. The combined rhythms eventually pull me out of bed. No one seems to mind the noise. This is just how Cuba wakes up in the morning. I follow the strongest beat to the back of the apartment and look out from the open air dining area where I’m greeted by a bright yellow wall against a blue sky. How curious that someone has felt strongly enough to paint half a wall in such a magnetic color in such an unusual location. Like the morning music, it’s another clue about the spirit of Cuba. As the morning goes on I become a dance partner with the balcony overlooking the street, where the neighborhood has come to life. Outside, inside, outside, inside… I unpack in the bedroom while taking quick little breaks to see who and what is passing by below. I see I’m not the only dancer. Everyone with a balcony has mastered this same choreography. Outside, inside. Inquire, retreat. Our casa particular is located across the street from a wonderful little Italian café where we enjoy coffee, breakfast and a warm welcome to the neighborhood. An old Ford Model T pulls up with a delivery of firewood for the café’s pizza oven. The scene in front of me probably doesn’t look all that different now than it would have in the 1930s. We walk to the malecón where the road and the seawall extend for several miles in a graceful curve on the north side of the city. The heat and sun are as intense as the blue of the sky and the colors of the cars driving by. These classic cars are everywhere, inspiring our constant speculation about make, model and year. It seems almost miraculous that so many are still running and in pretty great shape (the exteriors, at least) some fifty+ years since manufacture. A tiny vintage cab shuttles us over to the cerveceria near the ferry terminal and art market. It’s our first of many experiences with live music, beer and cigars. In this heat, a cold beer tastes really good. We hang out for a couple hours and continue our walk around the city. Most of the architecture of Havana is in dire need of restorative attention, but the remaining beauty offers tantalizing hints at how incredible this city must have been in its heyday in the early to mid-1900s. During that time, Cuba was enjoying freedom from former rule by Spain and relations between Cuba and the U.S. were functional. Havana flourished from a boom in tourism and foreign investment, but the growth of casinos and nightclubs brought gambling, prostitution and organized crime. This, along with repeated upheavals within the government, meant that the years leading up to the Cuban Revolution of the late 1950s were prosperous but challenging. Shortly after the Revolution and introduction of communism, foreign-owned assets were expropriated and the U.S. embargo began. 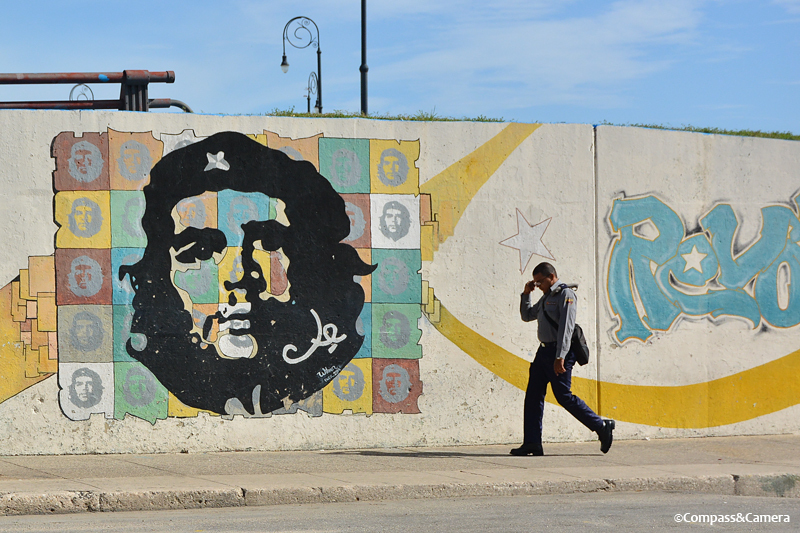 Cuba set off on a new path, independent of the sources of its previous economic success. The country stagnated and the eventual collapse of the Soviet Union further degraded the economy. Cuba found itself trapped in time, with no way to move forward. 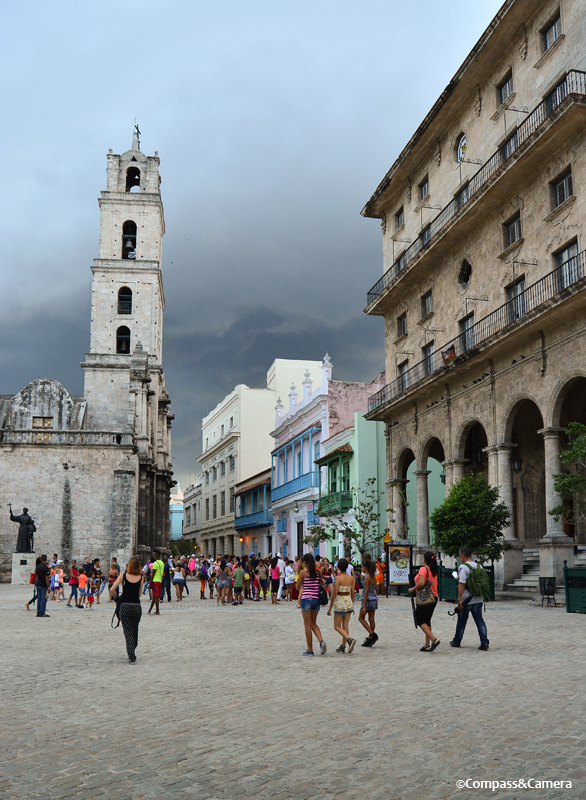 Havana’s streets tell the whole story — with plazas and churches from the 1700s alongside formerly beautiful buildings left unprotected from the clutch of age. With pastel colors and Spanish Colonial features, some streets resemble an unlikely mash-up between Prague and Cuzco. Other streets are rough and decaying but there’s always at least one friendly face peeking out from a window or a doorway. In some cases, the face we see belongs to Che Guevara. His visage is everywhere and it seems he’s the most endeared figure of the Revolution. We come to the Plaza de San Francisco and the rain begins to pour down. We rush into Restaurante Café del Oriente and feel like we’ve suddenly stepped 75 years back in time. The grit is gone and we’ve found Havana’s old opulence in this cafe’s enormous columns, Baroque crown moulding, and marble and brass bar. A young man plays a grand piano in the corner. He reads the crowd and spices things up with Queen’s Bohemian Rhapsody thrown in among the usual piano classics. The rain passes in an hour, leaving the city with a dull and dirty glow. We walk back toward our casa particular as life returns to the streets after the storm. 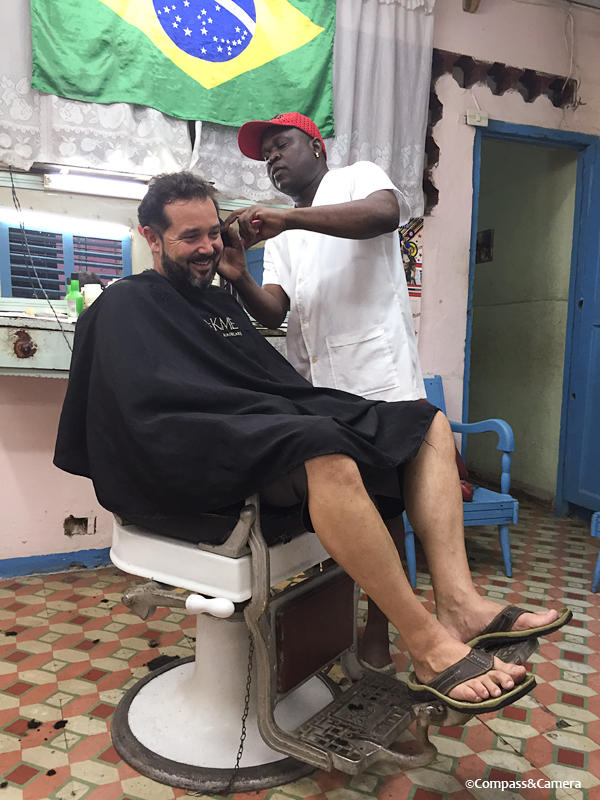 J stops for a haircut at the local barbershop — a tradition he follows in every country we visit. He never knows what he’s gonna get, but this guy in Havana does a better job than anyone in any other country. For 10 bucks. We get to the casa particular and I’m sucked back into the allure of the balcony, and Havana in general. The afternoon turns to evening, I watch the world go by and I wonder why we waited so long to bypass the border and come to Cuba. As Americans, the story we hear is that Cuba is barely getting by without us … unable to really prosper without the support of its biggest neighbor. Certainly, the Cuban people do face a lot of challenges but in the one day I’ve been in Havana I’ve seen happiness, warmth, gratitude, ingenuity and prosperity. It is far from destitute and the people here have pride, energy and determination. Cuba is not a country of people sitting idle with their hands out wondering when help is going to arrive. 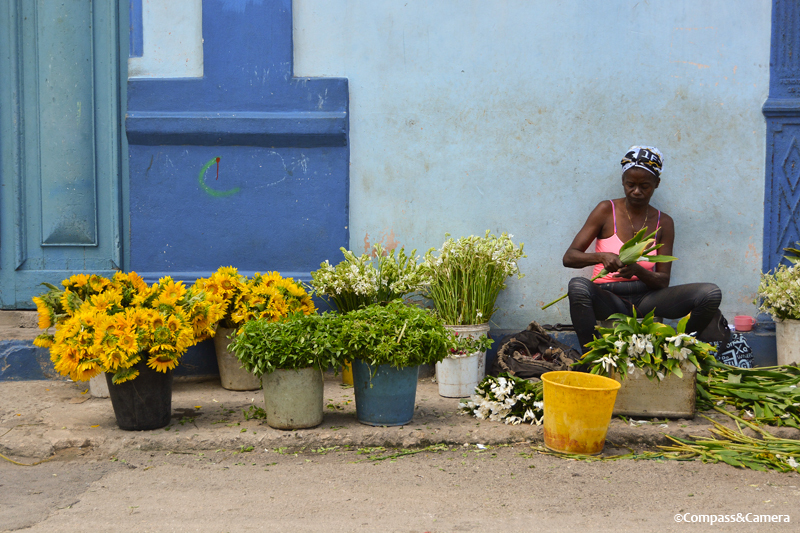 The next two days take us even deeper into the heart of Havana. 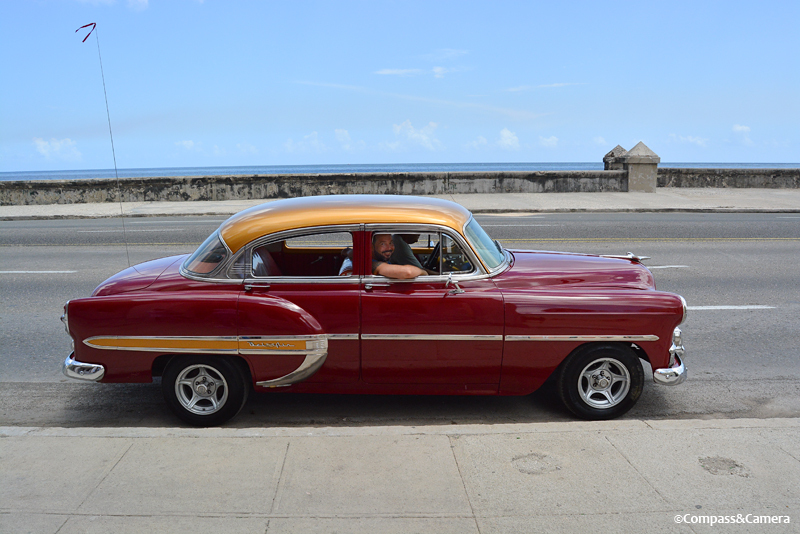 We hire a driver with a classic car to take us to the sights outside of La Habana Vieja. The Hotel Nacional sits along the malecón, overlooking the ocean. Our guide tells us it’s the first time in decades that the Cuban and American flags are able to hang side-by-side at the entrance, thanks to the diplomacy of Raúl Castro and Barack Obama. Everyone we talk to about the recent political developments is happy the two nations are reconciling. 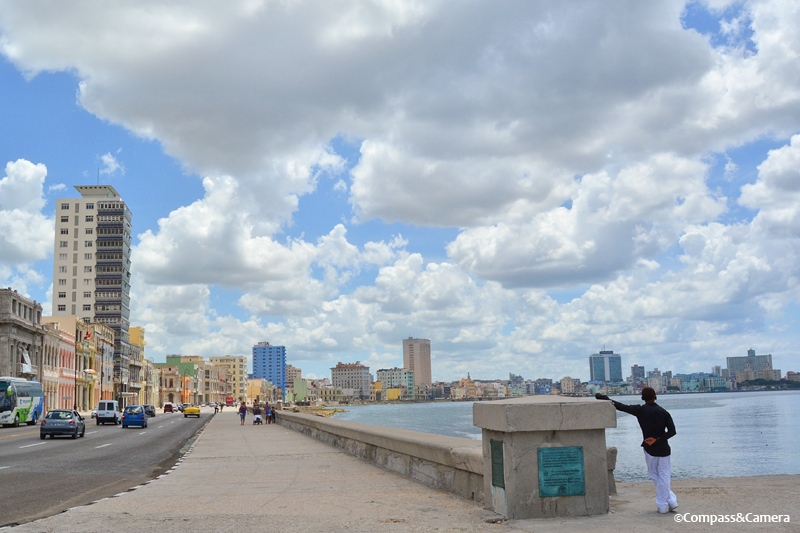 We stop at the Plaza de la Revolución — an enormous and featureless plot of pavement for important gatherings in Havana. Fidel Castro and Pope Francis have both spoken here. To the north, Che is memorialized in a steel line drawing on the side of the Ministry of Interior. The tower on the south side of the plaza is a memorial for José Martí, an intellectual who inspired Cuba’s independence from Spain. It’s fascinating to me that this island nation of just 12 million people has been the source of such dramatic history over the past 150 years — colonial rule, independence, revolts, the Revolution, the Bay of Pigs, the Cuban Missile Crisis, the U.S. embargo, and the saga of Guantanamo Bay. Maybe it’s that the principle characters of Cuba’s biography have been such dramatic figures themselves and geography has unavoidably provided the stage. Except for the book market, where these history lessons are lined up on the shelves, Havana has a peaceful demeanor that belies its tumultuous past. Business on the streets seems to be doing okay. People are selling what they can to make a living — fruit, coconuts, cleaning supplies, vintage books and magazines (Nat Geo from 1923, anyone? ), and even vinegar and cooking oils in recycled bottles that have been sealed up with packing tape. Stores, on the other hand, lack any proof that basic household needs can be reliably purchased. Shelves are empty except for canned tomatoes, cooking oil, baby formula and rum. Lots of rum. Necessity has forced the invention of the thriving economy we see on the street. We come across a group of guys playing a fierce game of dominoes around a nicely crafted table outside an apartment building. We watch and learn, and I love that they’re not at all bothered by our curiosity. I turn to look down the street and a classic car is coming toward us. But the driver sees some friends on the sidewalk, so he just parks the car and everyone enjoys a quick catch-up on the side of the street. It is Sunday afternoon in Havana. I can’t keep writing about Cuba if I don’t start writing about the music. The two go hand-in-hand. Never before have I been to a country where sound is such an integral part of the identity of a nation. In the handful of days we spend in Havana, we have the pleasure of hearing no less than nine groups performing on the streets and in the restaurants. Music is everywhere. It seems like everyone sings or plays an instrument, and we see a couple of the best musicians around town accompanying different bands at different times of the day. When the maracas get shaking and the bongos start banging, the rhythm of Cuba comes alive and street corners come to a standstill as everyone gathers to enjoy the music. The musicians themselves can’t resist the call to move. Their feet, their hips, their wrists … everything moves with a little bit of flare and swirl that is uniquely Cuban. Happiness radiates. Music might be the one thing — the most enduring thing — that has carried the country through history and escaped the turmoil and economic hardship. No wonder it’s such a big part of life. 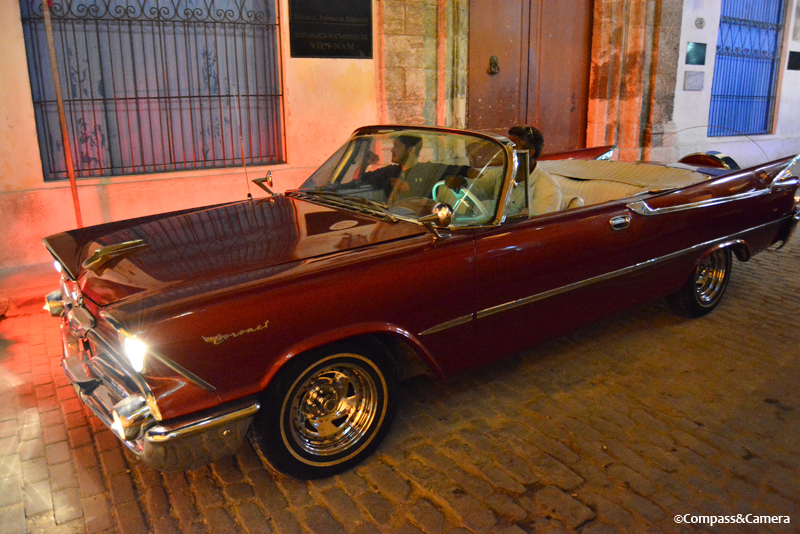 On our last night in Havana, J chooses one more classic car for a final spin around the city — a big, beautiful, burgundy, convertible Coronet. The only one in the entire country. As we take a look at the car, we get to know the family who owns it. The father is the driver and the son-in-law, who speaks perfect English, is the tour guide. Ingenuity meets opportunity. Do you wanna ride in my… Coronet? We all pile into the car and dad starts the engine with a big smile. I think he’s just as excited as we are to go drive around. He pulls away from the rainbow of classic cars parked near the capitol building. We go slow. We cruuuuze. We drive 20 miles an hour as the sun sets beyond the malecón, and we couldn’t be happier seeing Havana one more time from The Coronet. It’s an experience we’ll never forget — an experience found only in Cuba. It’s been a long time since I’ve been completely enraptured by a city but Havana has all the elements that make it happen — history, art, architecture, beauty, kind people, heart, heat, spirit and music … so much music. And the food? It’s okay. There is a lot of lobster so it could be worse. But let’s just say … the food is poised for its own revolution. I’ll raise a mojito and toast to that, as I run out to the balcony one last time and say goodbye to Havana. I already can’t wait to come back. Ah, Besos Discretos…perfect accompaniment to your love for Cuba not so discretos. Beautiful photography, so wonderful to see this lovely place, and get your first hand thoughts of life there. Gracias, Angel! I should have guessed you would know that lovely song. Thanks for reading and besitos back to you, mi amiga! OMG I am SO excited now!! This is fantastic eye and ear candy for Peter and I – I thank you once again for your fine reporting, from your heart & soul……photos are so cool! Kelly, I’ve read a lot of posts about Cuba and Havana, especially lately, but this one sings! (And I’m not saying that just because you brought up the musical background of your trip.) Your crush on Havana is palpable; I felt it in every sentence and photo. Cuba has been on my list for a while now, but I have been postponing it and pushing it away because *everyone* is going there and I’ve been feeling snotty about that. But clearly there is a reason, and you are the first to articulate that in a way that makes me put this country right back at the top of my list. Thank you for a beautiful, heartfelt post! Did you go on your own or through a company? If you don’t like to put that in a post, my blog email is on my About page. I just get overwhelmed by the planning part … and I planned my own trip to Russia! Cuba just seems daunting to me. I’m going to try hard! What a great selection of music to accompany this post…felt as if I was walking into the neighborhood, into the building and up the stairs to the apartment as you described and then stepping out on the balcony that “looks out on a street where thousands of days and nights and people have come and gone in Havana…” I can see how Havana grabbed and held onto your heart. Great photos and post. Your blog is the only blog I follow. Your commentary is always insightful. I’m glad you went to Cuba before us so we can benefit from your trip. Great photography too. Are the cars all old and so well kept? Or were there junker / new cars as well? Wow what an amazing post showing the vigour of Cuba, it’s as if we were being there when reading your vivid description! Thank you for offering us a fascinating glimpse towards this unconventional place. Hey, Bauhinia! Thank you so much for your comment. 🙂 Happy to know you enjoyed seeing Cuba through my post. Thanks for reading! We were scheduled to travel to Cuba while living in Mexico several years ago but the trip was cancelled by the tour company for lack of interest. We were so disappointed and Cuba has remained on our bucket list ever since. Loved your tour and photos! OMG OMG Kelly what a fabulous post. I can feel your joy and love of Havana. I felt like I was there with you. Your photos are superb, and writing just as good. It feels as if it’s been a long time since I’ve been so enraptured by a blog post. This sentence: Cuba set off on a new path, independent of the sources of its previous economic success. Such a simple elegant way to express the change. After reading this post we HAVE to get to Cuba! We are in Maple Ridge until the middle of September. After that we are back in Van until end of Oct or longer. We must get together! I second Lex. Cuba has been increasingly popular these days since the normalization of relations between the country with the US, and more and more airlines offer direct flights from North American cities to Havana. But this post is a relieving reassurance that despite the imminent influx of tourists to the country, Cuba is still an enchanting and romantic destination. As always, a very well-written post, Kelly! Thanks so much, Bama! We were able to bypass the restrictions and get there (illegally) from Canada before the influx happens this fall, when direct North American flights begin. I think, and hope, the identity of Cuba is secure enough that although there are big changes ahead, the underlying character and romance of the country will remain unchanged. But we’ll have to wait and see. Thanks for your comment and kind words! CONGRATS ON BEING FEATURED ON THE DISCOVER PAGE!! wooo hooo!! Thank you! I’m very excited, too! Yes! You’ve been discovered! Congratulations. Well deserved. Yes! Woohoo! A very good day. Thank you, Alison! I knew there was something really special about the Havana post! Cheers back to you! Thank you, Katherine! Hey! Thank you so much!!! Great series of photos. Can’t wait to go! This looks absolutely incredible! I’m DYING to visit Cuba! Hopefully within the next year! Thanks PaigeBrown! It IS incredible. I would go back right now if I could. 🙂 Thanks for your comment! Hope you go! Looks fantastic. A country I’ve always wanted to visit, and this has reminded me to put it higher on the wish list. Thanks for your comment, kandc12! That’s exactly it — a simpler time and the charm that comes with it. Hope you get to tick Havana off your bucket list! Havana today, Boston tomorrow. Same as St. Petersburg, Budapest, Prague, etc. Well, you got to see one of the pearls of the world. Lucky you! Great story ,pictures are fantastic. Wow! It couldn’t have been reported more amazingly!! Liked mostly all your pics!! Superb! Keep the good work rolling!! That is a beautiful mural of che guevara. Was it hard for you to enter Cuba? Which cuban currency did you use? Im sure they have two. great post. Now, I feel like visiting. No problem. Thanks for the great pictures and blog post. Visiting Cuba is on my bucket list. hmm, seems like the cuc is used more frequently. Awesome! That’s exactly what I try to do with my writing and photographs. Thanks for reading, Ingrid! Your welcome.Thanks for sharing it. Thanks so much! Happy to know this inspired you to go to Havana! Very good article. Love the photos. Oh the cars!! I know, right? The cars were amazing, everywhere you look! Thanks for reading! Beautiful photographs and amazing place. It’s great you had a happy journey there. . Thank you! Yes, I’m very grateful to have had such a happy journey. Thanks for your comment! Awesome ! Cuba was one of my first travelling experience and I loved the fact that it was actually as I imagined it. Mojitos, people dancing in the streets, beautiful landscapes, friendly and warm people. Definitely a must do before it gets too touristy. Hurry up! Thanks! Yes, you’ve described Cuba perfectly. How lucky it was one of your first traveling experiences! I already can’t wait to go back. Hopefully it won’t change too much. Thanks for your comment! You have written this so perfectly… It ignites a want in me, to go Havana…. What a nice comment! Thank you. Love that you’re inspired to go! Thanks for reading! Love the photos…they really seem to catch the aura of the place (though I have never been). Thanks for sharing! Nice comment! Thank you! Happy you enjoyed the photos. Cool that you’ve been to Cuba! Thanks for reading. I’ll check out your blog. Thanks, littlegreenraven! Compass @ your work is not like others! it is very different and great. Great post and photographs! I have been playing with the idea to visit Cuba next summer, but I am still not sure given the steps beforehand and, mostly, the money I will need! Even so, it is still in the running. Thanks for sharing your experience. For how long were you in the country? Did you find 12 days sufficient or would you have liked to stay longer? Ah, thanks a lot.I have been reading a lot about the slow travel between cities. My worry about going for three weeks is that I won’t have enough money considering the cost of everything. Wonderful view of Cuba …. You had me enraptured from the first shot…bravo, I love to find such posts…thank you so much for sharing your wonderful experience….. Thank you so much, Vicky! Happy to know you enjoyed the post. Thanks for your comment. Can’t wait to read more of your blog!! Looking forward to seeing where you’ve been and reading more about your life in Dubai. Your frame photo is great! Thank you so much….I hope you enjoy my journey! Beautiful country beautiful people. The colors are so vibrant. I’ve traveled all over Mexico and not once in a resort. So, I get it. You visited the real Cuba. Reminds me of a trip I took to Nicaragua. Sans classic cars. Great article. Thank you! Cool that you saw the real Mexico and Nicaragua, too. I agree — it’s important to get away from the resorts if you really want to see a country and its people. Happy to hear you enjoyed my post. Thanks for your comment! Thank you, Janhvi! Happy you enjoyed the pictures and post. Thanks for your comment! Great post and pictures! We want to go to Cuba now! Perfectly synchronized visuals and narrative – my mouth will keep watering until I visit Havana and stay at the same casa particular! Thank you so much, writegill! Happy you enjoyed the post. Hope you have a great time in Havana! Good captions, looks like a great country too. Yes, Cuba is a great country. Thanks for reading! Thank you for sharing your experiences and your fantastic photos too! Cuba is definitely on my list. You’re welcome, Michelle Rae! Thank you so much for reading! Hope you get to Cuba someday. Terrific post. It brought back great memories of two trips we took to Cuba two years in a row, over Christmas and New Year. Loved it so much we were inspired to write 20 posts covering our total of about six weeks there……! I am wondering if you traveled around the country at all, or just stayed in Havana. It was actually the smaller places we found more entrancing than Havana. But oh the gorgeous cars, the music, the people. Love the photos. Well captured. Hope you go someday, Stuart! Thanks for reading! You have described it beautifully. I have always wanted to see Cuba, Havana. Now i Definitely will. Awesome! Yes, go see Havana. You won’t be disappointed. Thanks for reading! Thanks for sharing – must go! Gorgeous photos and I love the title! Love your style of writing and your beautiful photography. Cuba has always been on my dream travel destinations list, and I hope one day I can experience the same beauty you found there. Hey Gabrielle! Thank you so much for your comment. Hope you get to visit Cuba someday. Thanks for reading! Thank you so much, talkingspirits! Great to hear you enjoyed this post so much. I just posted about Trinidad if you’re interested in reading more on Cuba. Thanks for your comment! Aw no problem😊 and yes I’d totally love to check out you’re new post, it would also mean a lot to me if you’d check out some of my posts too maybe. Thank you, andrewsia! I appreciate your comment on my writing! Hope you get to visit Cuba someday. You make me love Cuba. Does everyone really use those classic cars? Yay! Cuba is worth loving, I promise edidiongudoh. 🙂 Not everyone uses the classic cars, but they are pretty much everywhere. I would say the split is about 50/50 classic vs. newer models. Thanks for your question and for reading my blog! Great article and great pictures! Cuba is definitely a place I’d like to visit, even more so after this post!! So gorgeous had to look again – just love everything about this – text, pix, layout – beautiful! Looks like you had a great trip ! I just got back from 2 weeks around Cuba .But haven’t even got around writing at all .I really think you did great job on photography . Thanks so much! Did you enjoy Cuba? Where did you go? Thanks for your comment! Loved your post on Cuba! So happy I found it as I have been feeling the urge to visit Cuba recently and your description of the places you visited and experiences you’ve had have really ignited a fire to make it happen this year. It is one of the best blogs on Cuba I have read so far. Thank you for the inspiration! 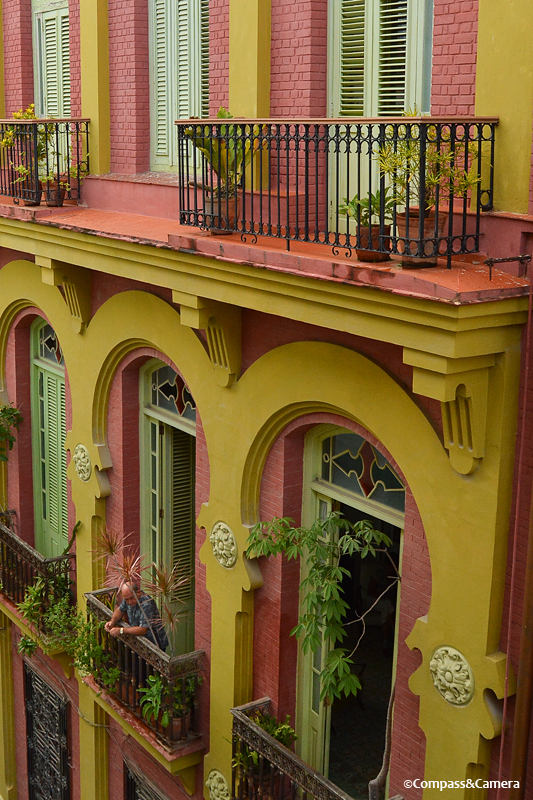 I wonder if you would mind sharing with me the Casa Particular that you stayed at in Havana Viejo. Would you stay at that same place if you were to return? Thank you! I will send an email. Total travel envy. I hoped to go to Cuba on this trip, but wasn’t to be. I agree! The history is so recent, and can still be felt everywhere, especially with figures like Che and Fidel. I wish I knew Spanish and could talk to some of the people who lived through the Revolucion. Thanks for your comment! Visiting Cuba is one of travel dreams. After reading it I want it even more. Thank you for sharing the photos! Thanks so much, Curt! Great to have you along for the journey! Kelly…I just now happened upon this. You wrote it in August when I was…not online, not reading or writing or commenting on posts. Dang work! But…such a lovely post and Congrats on Discover!! I hope that does help you to write more, because I simply love your style, your choice of words, your vibe. Like this: a mix between “Prague and Cusco”…ha…I get it! But J in the barber chair…no…I got a haircut in Florence once…no more haircuts where they don’t speak English for me! Question…is there a site where you rented your casa? And the sweet ride in the maroon and gold 53 Chevy? Well hello Badfish! Thank you for the sweet message! I somehow knew that you, of all people, would understand that strange mix of Prague and Cusco. 🙂 We rented the Havana house through a contact in Cuba named Pavel. He was super helpful (also helped us book our houses in Santiago de Cuba) and arranged pickup from the airport on arrival in Havana. I can send you an email with his contact info (I think I have your email address?). Thanks for loving my style. Sometimes I feel like I don’t have any! But I’m working on it. Yeah, a mix of Prague and Cusco–who wouldn’t love that. I’d like to see a mix of Bali and Banff somewhere. And yes, please, send me the contact info. I’m going “somewhere” in December. Cuba is one of the options, but I’m wondering if that is the wrong time to go…Xmas? Your style: please do not work on it! It is perfect as it is right now–great info, a bit of wisdom, and sentences that punctuate themselves with insight. Omg, what a lovely closing sentence. A gift. Thank you, Badfish. Bali and Banff — now there’s a winning combination. So far… elusive. But I’ll keep looking! Will send you Pavel’s details. Enjoy the weekend! It’s Thanksgiving here! I work on Thanksgiving and Xmas!! I can’t find an email address for you (thought I had it but I guess not) so here are the Cuba deets. Here’s where we stayed in Havana: renthavanacuba.com/house/get-house/42. This house is two bedrooms — I’m sure could find a one bedroom for cheaper. Pavel was our contact and he arranged transport from the airport. His email is rent at renthavanacuba dot com. Here’s where we stayed in Trinidad: airbnb.ca/rooms/12282178. Andrea (host) is very helpful, Luisa (on site) was great and speaks very little English. We stayed here on our last night in Havana: casaaltahabana.com. It’s very central, but not private. They rent rooms (big, with ensuite bathrooms) on the 4th floor (no elevator). Hope these links are helpful! Let me know if you plan on going to Santiago de Cuba. I know of two places to stay. Kelly…whoa, thanks SO much for all this info. I’ve read a couple more posts about Cuba. But I’m still being non-committal! I want to go there before the Big Bang of Americans, but something is stopping me from just doing it???? It is a long way. That’s one thing. But not a deal breaker, but I feel the same way about Bora Bora, it’s actually closer to the States, why not wait till I go back there. That’s one side of the coin. But yeah, I’m not quite sure what I feel about Cuba. I do like they speak Spanish…the only language I can speak a little of. Such a great post, thank you for it! I am going to Havana and other Cuban cities to get a feel of the country before it becomes like pretty much any place on the Earth and was fishing for some tips but I found much more than that. It is as if I was able to spend a day there with you. Nice pics and very interesting post. Congrats! Great post … thank you! I’m planning a trip to Cuba. Any advice on where to eat? places to see? etc. Thanks, AJ! In my opinion, the best thing to see in Cuba is just… LIFE. Spend a few days wandering the streets of Old Havana, ride in an old car on the Malecon, get out to the countryside and visit a tobacco farm, sit and listen to the live music every afternoon… Cuba comes to life through its people. Yes, there are churches and landmarks and historic sites to see where big events have happened but the real experience lies in slowing down and taking it all in on a personal level. Have you seen my post on Carnaval in July? (It should pop up if you do a search.) That’s a great time to be in Santiago de Cuba (south end of the island) and see INCREDIBLE Cuban culture. Make sure you see one of the evening parades down by the water. For restaurants, search for Lex Klein’s blog called One Foot Out the Door. She found a great restaurant in Havana that she highly recommends. We ate at paladars we came across as we walked the streets — nothing too remarkable but pretty good throughout Cuba. Hope you have a fantastic trip! Hi! I just came back from Cuba and had a great time. If you are interested in some recommendations, please check out my blog at wheresjwo.com. Thank you! I’ll check out your blog. I would love to go back to Cuba and explore more. Happy to hear you enjoyed your time there. Thanks for getting in touch! Absolutely an incredible piece of writing and photo journalism. I loved the story. Now I want to go see Cuba. Thank you so much. Tim! Thank you so much for your comment. I’m sorry it’s taken me so long to reply. I’ve been traveling and now I’m trying to catch up with my reading, writing and comments. 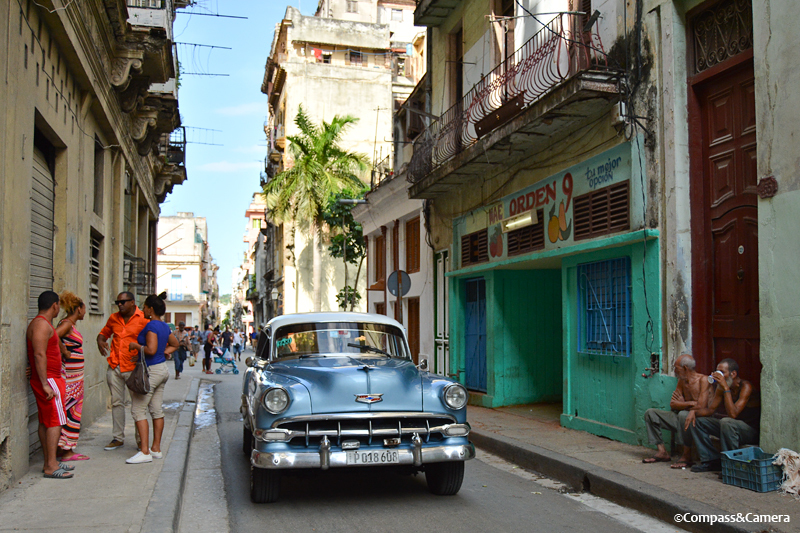 Very happy to hear you enjoyed this post on Havana, and it has inspired you to go. It’s a very modest city that just oozes character and personality, from now and way back in its heyday. Definitely unique in the world and worth seeing. Thank you for reading! Hi! Your photos and write up brought me back to the time I spent there last month. It’s funny how vivid my memories still are; must be related to how vivid the city itself is. Thanks for sharing. Yes! I agree! Vivid is a great way to describe Havana. I can’t think of anywhere else like it. Thank you! I hope you go! It’s an amazing, historic city worth seeing. Thanks, Thrifty Campers! Happy you enjoyed the video — Cuba just can’t be conveyed without music and dance. Enjoy your weekend and thanks for reading!